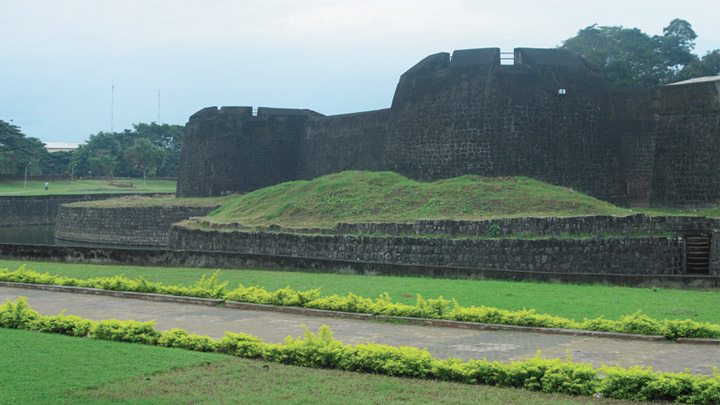 The Tipu’s Fort, also known as Palakkad Fort, stands in the heart of Palakkad town. Palakkad is a small town on the lower edges of the Sahyadri ranges of the Western Ghats, with patches of dense forests and crisscrossed with rivers. One of the well preserved forts in south India, Tipu’s Fort was constructed in 1766 AD and is today a protected monument under the Archaeological Survey of India. The sober majesty of the laterite walls of the fort reminds one of the old tales of valour and courage. The fort was built by Hyder Ali (1717 – 1782), the emperor of Mysore province (now part of Karnataka State), supposedly to facilitate communication between both sides of the Western Ghats, (Coimbatore and the West Coast). He had captured the Malabar and Kochi regions which come under the West Coast area. His son Tipu Sultan (1750 – 1799) a warrior as well as a linguist was known as the ‘Tiger of Mysore’. Tipu waged a series of wars against the British colonial rule.